If you are traveling abroad you can still bring along and use your North American applicances such as irons, electric shavers, hair dryers, etc. which aren't dual-voltage appliances, as long as you have a voltage converter. 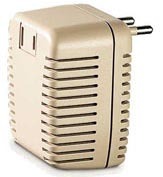 There's a whole range of affordable voltage converters, power transformers, AC adapters and foreign plug adapters, regulators and plug adapters available for 110/220V power conversion. We've selected some of the best 110/220V power converters below. But if you're not sure what type of voltage converter or adapter you need - this handy Voltage Transformer/Converter & Adapter Guide explains all about international plug adapers, travel voltage converters and and voltage transformers. Automatic Combination Voltage Converter When traveling in Europe or in other countries with 220/240 voltage power this voltage converter makes using your favorite electronics and personal appliances easy. You won't have to leave your favorite gadget, electronics or appliance at home if you pack this handy voltage converter. 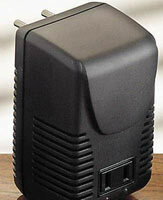 The Auto Combination Voltage Converter works for heating and non-heating appliances. The Auto Combination Converter combines the functions of a Transformer Converter and a Converter for Heating Appliances, automatically switching itself based on the appliance being used. This Voltage Converter is perfect for use with electronic appliances up to 50 Watts and also for heating appliances up to 2000 Watts that are built for North America use and require high-quality electricity. Voltage Converter for Motorized Appliances This voltage converter for motorized appliances is built for use when traveling outside North America for razors, radios, CD players, camcorder rechargers, tape recorders, and other non-heating appliances up to 40 watts that are built for North America and require high-quality electricity. Made in the USA. This voltage converter has a heat-sensitive circuit breaker. For operating your 110-120 volt appliances on 220-240 volts outside North America. (2 3/4 x 1 3/4 x 2"; 11 oz). 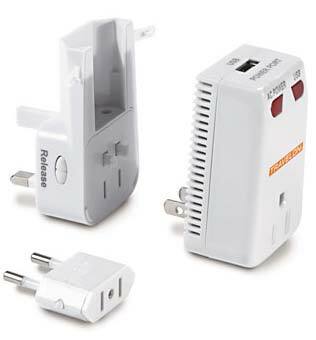 World Travel Guide - Voltage converters, power transformers, AC adapters and foreign plug adapters, regulators and plug adapters for 110/220V power conversion for worldwide use.